Pre-Competition nerves is one of the few things I can say I have in common with my idols! Whoever you are, whatever level you ride at, this is something that most of us have had to deal with at some stage. We all have different triggers, it may be that the thought of entering the arena at A is enough to turn you to jelly. Perhaps the thought of losing a few colored poles or suffering a 20-penalty run out makes you question your discipline. For some of us it is the overbearing fear of ‘what if’. But whatever triggers your pre-competition nerves, the first step to coping is to realize that it is normal to feel anxious on the lead up to a competition. You are not alone, do not be ashamed of your pre-competition nerves. Know that what sets you apart from your competition is your ability to manage your nerves, not to expel them. That anxious feeling in your stomach can be a good thing. It can make you more alert, more ‘ready for action’. This is due to your body’s natural reaction, when put in what could be considered a situation that requires your “fight or flight” response. However, there comes a point where it is no longer a benefit. Where it begins to affect your confidence and your ability to perform at your best. This is when we have to learn to manage it, to produce a good balance of nerves and confidence. Visualization is a really simple exercise and extremely effective if done right. It doesn’t matter what sport you’re involved in or what level you compete at, this is a very useful tool across the board. Visualization is a mental rehearsal, you will imagine yourself riding your test or your round, exactly as you want it to be. The whole experience is positive, and you are telling your sub conscious how this is going to go. I always find it best to find a quiet spot, maybe in the lorry after having walked the course. Shut your eyes and just go over and over your perfect round. For further visualization, capture each fence on your phone. You can then have the course in front of you as you work through it. 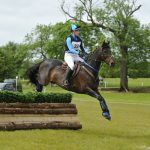 There are also equestrian apps dedicated to course walking for the cross-country stage, these can help plan out your route. In your mind, ride every movement, every corner or indeed every fence just as you want it to be. Do not let any negative thoughts creep in, they are not welcome here! Personally, I find this really useful for many reasons. It stops me thinking about all the things that could go wrong. Instead, it gets me concentrating on how it could all go right! It gives me a plan and gives me something to concentrate on. Preventing my mind wondering to all the potential negative outcomes! It helps to keep me relaxed and avoid getting too wound up before getting on board. This is an important one to me, we plan our horses lead up to an event down to the last minute but rarely consider ourselves. Remember it isn’t just your horse that is the athlete, you are too. You need to make sure that you are as physically and mentally prepared as your horse. Give yourself plenty of time, and I don’t mean for your horse’s benefit. The only way you are going to stay relaxed and in a position to cope with your nerves is if you have the time to. There is nothing worse than rushing around, this will only get your adrenaline up and in turn your anxiety. Learning to control your breathing can help to significantly reduce anxiety. For me not only does correcting my breathing help me to relax and lower my heart rate. It gives me something to focus on, rather than the impeding terror of the Show Jumping arena! This is something you can really focus on through your warm up and whilst waiting to go into the arena. Simply taking a deep intake of breath in through your nose, counting to 3 then gently exhaling through your mouth repeatedly can really help. Again, I find this helps take my mind off those pre-competition nerves. Eliminate the ‘what if’. So, you have by this point visualized over and over how right this could go. But if you’re anything like me your brain will be trying its very best to imagine every catastrophe possible. Remember that your horse has no intention not to perform to its very best. Things go wrong of course, but they go right more often than they go wrong. You need to stay in the moment and stop thinking what if. Every time you feel yourself slipping into the trap of negativity, pull yourself out of it and keep yourself in the moment. So, you annihilate the warm up oxer. Poles are scattered everywhere. Your striding was off and nothing about it went right, so what? It doesn’t matter. Come again and don’t let it affect you. Take a moment to re-group and relax again. You know how to do this, breathe and stay positive about it! It’s all about learning from it and moving on. Don’t be ashamed to seek help when it comes to managing your nerves, you would take coaching for your riding. Why not take coaching on how best to manage yourself from a psychological point of view? I had coaching in 2017. During the Show Jumping round of a 3-day event, I let my nerves get the best of me. This resulted in my horse having a very bad round because I was quite simply terrified of something going wrong. All the sessions were over the phone and it left me feeling much more equipped to deal with my pre- competition nerves. You can also use meditation techniques to help calm your nerves. Nowadays you can access loads of meditation exercises from your phone, allowing you to do them anywhere. Many apps have been designed for meditation and have a series of exercises to help you out. Finally, just remember why you are doing this, we all know that you are going to go home from the day looking for the next one to enter!